The nuns at St. Pauls, where I began my grade school education, constantly complained of my penmanship. Often, my “p’s” were backwards. Or my “q’s” looked like “g’s. My 2nd grade teacher, Sister Mary Regina used to thump me in the head, telling me “You can do better Mr. Buckman”. I took typing class mid-way through my freshman year in Boys Town, only because assignments in ANOTHER class I was taking, were required to be at least legible, and I was struggling. As a typist, I consider myself mediocre, but I soon became fond of the task. I could actually read what I had put to paper! Throughout High School, some instructors returned what I considered to be well constructed work, with notes, “Unable to decipher…” or “Please re-write.” when assignments were written in my illegible longhand. Even my guidance counselor got involved, noting on one of my freshman report cards, “A college will expect better penmanship.” (I STILL have that report card in one of my scrapbooks!). Hence, the decision to take up typing… What does this have to do with ANYTHING…? The piece, “Arizona Formations” and “Up The Canyon” was inspired by my time and travels around Ragoon. At least take the time to read my thoughts, regarding these two pieces if you want an understanding of my thoughts during my years on the road… By clicking on the links, you will be taken to my artwork. 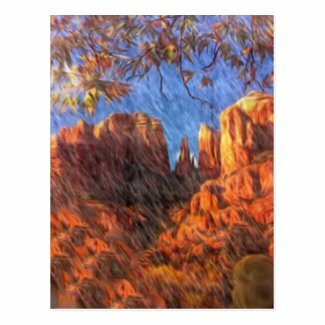 This entry was posted in Appreciation, Arizona Art, Arizona Mountains, Art & Culture, Art History, Blank Greeting Cards, Boys Town, Boys Town Alumni, Canyons, childhood memories, Colorful Art, Deep Purple, Desert Paintings, First Class Postage, Get Well Cards, Holiday Postage, horses, Interstate Travel, Memories, midwestern artists, Mojave Desert, Native American Folklore, Nebraska Travel, Nogales Arizona, Posters Cards Gifts, Ragoon Arizona, reprints, Rural, save the date cards, St. George Utah, Summer, Thank You Cards, Trucker Buddy, Trucking, United States Postage, vintage art, wall art, wall hangings, Western Artists and tagged Appreciation, Art & Culture, Blank Greeting Cards, Boys Town Reunion, Camera Filters, Custom Postage, Digital Photography, every day greeeting cards, First Class Postage, Holiday Cards, interior decorating ideas, Interstate Travel, living space designs, nebraska artists, Posters Cards Gifts, professional photography, Summer, Trucking, unique art. Bookmark the permalink.